Mr. Frank Horch, Hamburg’s Senator (“minister”) for Economy, Transport and Innovation was quoted in a statement issued by his ministry (June 2, 2015, in German) as emphasizing the immense logistical challenges involved with “mega ships” that involve things as simple as the required surface area to put the cargo on before transporting it to the hinterland. The minister called for an open discussion of the holistic economic costs of mega ships for the society at large. As Die Welt reports, such mega ships require significant infrastructural changes on the ports’ side to handle them, which would need huge investments by tax payers, while possibly benefitting just a few. Security risks in case of an accident would be also extremely high, probably running into billions, says the report. Is this trend to mega ships possibly merely a result of ever increasing over-engineering and an indicator of some sort of “megalomania” in a questionable pursuit of profits and technical achievement as an end unto itself? Or, is it actually needed to reduce transportation costs and thus increase affordability? How can the need for ecological, social & economic responsibility in innovation be better achieved? The theory of the “invisible hand” (Adam Smith) seems to fail when the participants are not “aware” of what is really in their own best interests in the long-run and when short-term gains outweigh other considerations. This is possibly where frugality comes into play – as a reminder to reduce the total cost of ownership/usage that includes the societal and environmental costs. 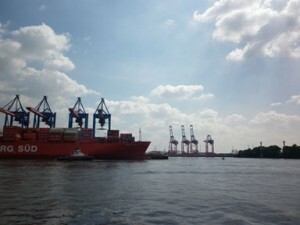 This entry was posted in Deutsch, English, External Reports, Thoughts and tagged Hamburg Port, Maritime Industries, Mega Ships, OECD Studies, World Ports Conference by Rajnish Tiwari. Bookmark the permalink.